So the first image of Red Tornado from the upcoming Supergirl TV show hit the Internet last week, and, well…I’m less than impressed. It’s made the rounds a lot so far, but I figure I should post it anyway for posterity. Someday, future geeks will dig through the Internet like archaeologists and will hopefully stumble upon my site. They’re going to want to know what I thought about a random TV character in a superhero TV show circa 2015. 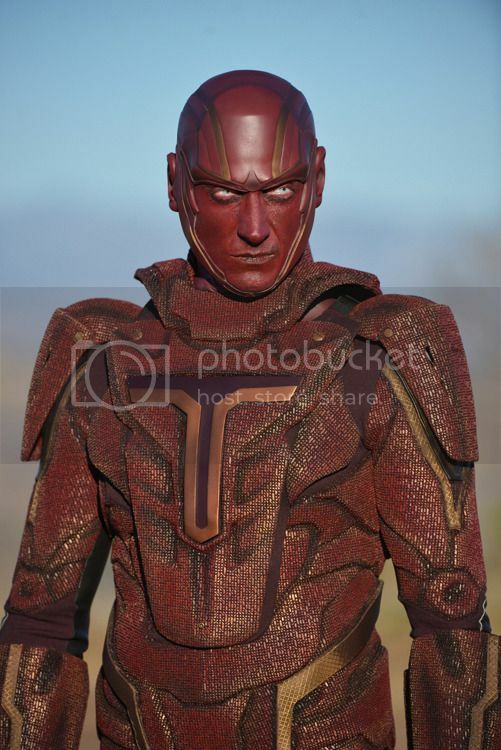 That’s actor Iddo Goldberg in the Red Tornado gear, and, well…just look at the poor guy! Red Tornado is an android in the comics, and I think they’re carrying that story over into the Supergirl TV show. But he’s definitely an android on a budget. The face, obviously, harkens back to the Vision from Age of Ultron. And that suit, jeez. They clearly wanted the segmented look of a good Iron Man armor, but that is clearly just lines painted on felt. That’s not an android body armor, that’s a shirt. Hopefully it’ll look better in live action. And we better not see a different Red Tornado in Arrow or The Flash, because I’m still holding out hope for a crossover! Posted on September 21, 2015, in DC, Television and tagged Red Tornado, Supergirl. Bookmark the permalink. 3 Comments. If i ever needed another reason not to watch Supergirl, I think this is it. The Vision looked awesome, this dude looks like someone out of some old british sci-fi tv show. He looks like an alien from a very bad, low-budget 80’s sci-fi movie. He looks like an experimental model design for a 1950s Japanese monster movie.